Granada, a high altitude city of romance and folklore, boasts one of the most popular tourist attractions in Spain, the Alhambra palace-fortress. Built primarily by the Nasrid rulers in the 14th century (although essentially built between the 9th and 16th centuries) the Alhambra is the most important and spectacular piece of Moorish architecture in Spain. The huge complex, set against the backdrop of the Sierra Nevada Mountains, includes the Summer Palace with its fountains and gardens, the Palacios Nazaries with its intricate ornamentation, and a hilltop fortress. 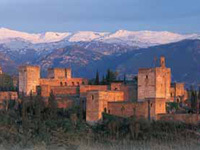 The Alhambra is a place of spectacular beauty and grandeur and is a UNESCO World Heritage Site. The queue to get into the Alhambra gets ridiculously long and tickets should be booked online or booked weeks in advance to avoid disappointment. At least one full day is required to really explore the vast complex. Although the Alhambra is the city's main attraction, Granada is a fascinating place and also boasts a number of other gems, including the Cathedral containing the Royal Chapel where Isabel and Ferdinand of Spain lie buried, and a Moorish medina area, known as the Albaicin, which has labyrinthine, narrow streets and whitewashed houses. North of Granada is Sacromonte Hill, famed for its cave dwellings, which were once the home of a large gypsy community. The Interpretation Centre has an Ethnographic Museum detailing the history and culture of the cave dwellers.